The Lego Mindstorms NXT and NXT 2.0 kits  contain software and hardware to create customizable, programmable robots. They include an intelligent brick computer, a set of sensors and motors, and Lego parts to build and support your creations. These kits have been out for about 10 years, and they are used in many schools and public libraries. We were able to find a used set for about $120, which allowed us to create an aerial tramway that transports a gondola from one station to another. For this project, we did not need to program the Lego NXT brick. 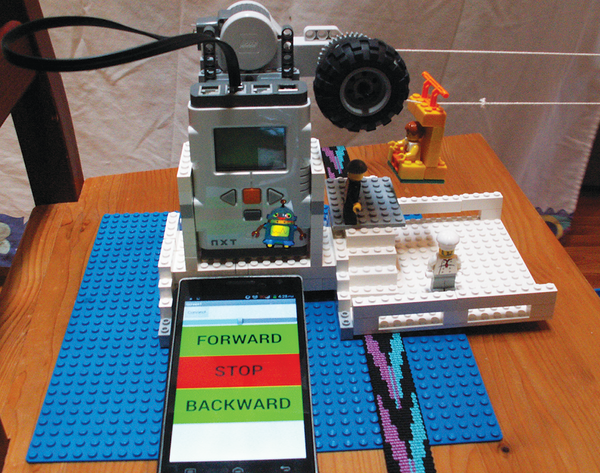 All the programming was done in the MIT App Inventor  web app using their Lego interface. The newer Lego Mindstorms EV3  could also be used. In fact, for the MIT App Inventor interface, you will need to use the EV3 blocks instead of the NXT blocks. The Lego Mindstorms motor should be connected in either the B or C port on the brick (which we will define later in the App Inventor Designer in the DriveMotors field). 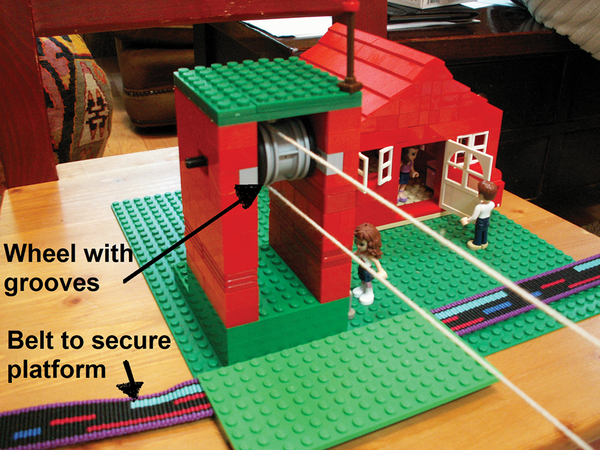 Figure 1: Lego tramway station 1. Figure 2: Platform setup for station 2. Securing the platforms. We put our platforms on chairs and used belts to keep them from moving. A carpeted floor will help keep the chairs from slipping. Building a small gondola. It's tempting to make a big gondola, but we found that big gondolas had more string slippage, and you had to have the gondola stations closer together. In Figure 1, you can see the size of the gondola we used. Using wheels with grooves or rims. If you use wheels with grooves or rims, the tramway string is less likely to slip out. The Lego NXT brick needs Bluetooth turned on. 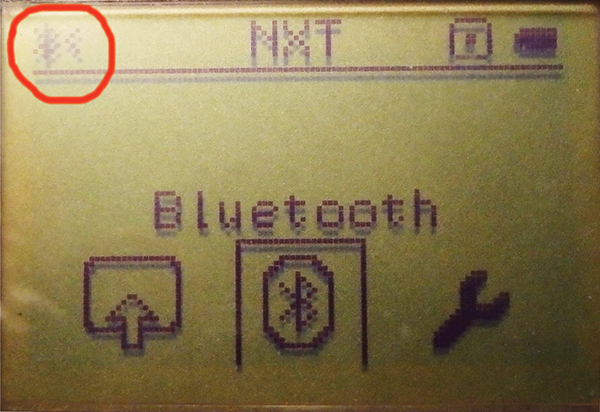 Check the top left corner of the Brick's screen to see if the Bluetooth symbol is showing (Figure 3). If it is not showing, go into the Bluetooth options and turn visibility on (Figure 4). Figure 3: Lego NXT Bluetooth status. 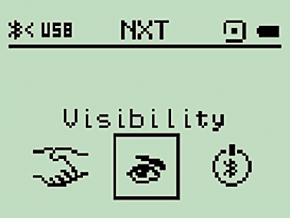 Figure 4: Lego NXT Bluetooth visibility is on. To pair the Lego NXT Bluetooth with your Android phone, on which Bluetooth is enabled, choose in your Android Bluetooth settings Search for Devices. The Lego NXT brick will appear as NXT on your Android phone. On the phone select Pair with device, and the phone pairing dialog will come up. The pairing request dialog (Figure 5) might look different for different versions of Android, but the key is to enter the correct pairing PIN. Figure 5: Android Bluetooth pairing request. 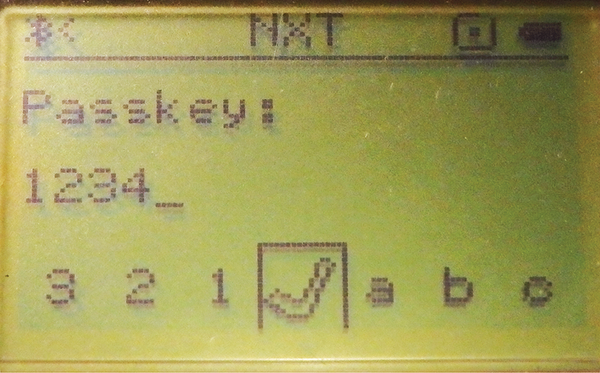 When pairing has started, the NXT brick will beep and prompt you for the pairing passkey (Figure 6). For the pin code (passkey), use the default 1234, and finish with the check mark. 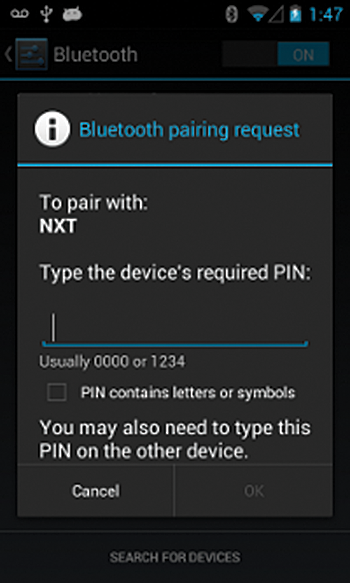 This pin code is used on both the NXT and on the Android phone. Figure 6: Lego NXT pairing request.